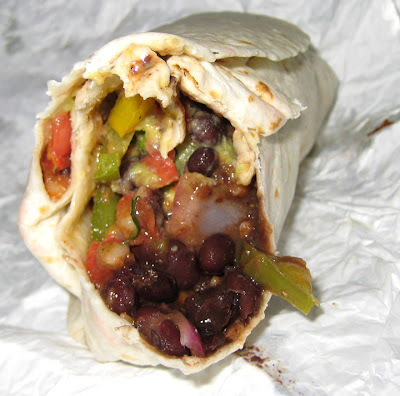 Despite the name, California Tortilla is a local chain, started in Bethesda in 1995. I've been generally disappointed by most Tex-Mex-style chains, and CalTort is not the refreshing exception to that rule. A couple years ago, while attending a knitting event called Stitches East at the Convention Center, I tried the outpost on Pratt Street for a quick lunch between classes; I remember not being particularly impressed. But on one recent Spring day, one on which the UMB campus is without a food truck, I decided to take a little stroll and give CalTort another try. I can eat tacos every day (as I did for three days in a row a couple weeks ago), so I decided to try the pork carnitas soft taco combo (with chips, queso, and a drink) over CalTort's burrito and quesadilla options. 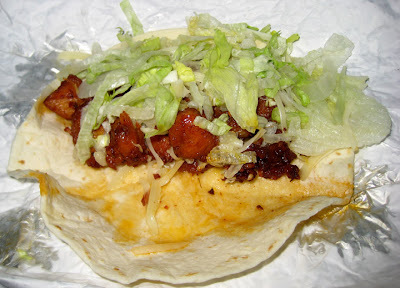 The two tacos each had with a generous amount of shredded stuff - pork, cheese, and iceberg lettuce. The tender meat had a bit of an acid bite that might have been lime - hard to tell because it was so salty. The accompanying salsa, served on the side, was a bit spicy, but otherwise tasted of canned/cooked tomatoes. The completely unnecessary side dish of chips and queso (rice and beans is also available) was a bit more flavorful. The tortilla chips were fresh (albeit not fried-in-house fresh) and not too salty, and the cheese sauce, decorated with bits of tomato, cilantro, and jalapeno, was nicely spicy and a couple steps above ballpark nachos. Ok, not too many steps, but it was a darn sight better than melted Velveeta. Not a horrible lunch, but nowhere near as tasty as tacos from Gypsy Queen. A couple weeks later, I signed up to receive the CalTort newsletter via e-mail and was rewarded with a coupon for a free taco. Perhaps "rewarded" is the wrong word; "punished" might be more appropriate. With it, I tried a taco with a "blackened chicken" filling, and boy I was glad that it was: 1) free; 2) not the only thing I had to eat. Again,"blackened" was probably not the right descriptive; "dessicated" or "mummified" would have been more appropriate. The chicken was so overcooked, it was not only dry, it was crunchy. I spat out the first bite and threw the rest of the taco in the trash. And the poor starving children in China are crying over my blatant waste. Can't really blame the chicken's texture on having sat in a steam tray for too long - I hit the shop at 11:45am in order to avoid waiting in line with the lunch rush. Of course I don't know that they didn't cook the meat at 8am either. I fared much better with the small "no-meato" burrito I had also ordered. Packed with a melange of black beans, rice, veggies, and a sauce that was both tart and quite spicy, it was actually decent. And it wasn't too salty, like the food in some other fast-casual Tex-Mex joints (I'm looking at you, Chipotle). There are lots of other things on the CalTort menu to try, including salads and quesadillas, but neither of these meals thrilled me enough to go back. But....starting May 9, they are adding limited edition "Bangkok Shrimp" to their tacos and quesadillas, and that might be enough to tempt me in for another try.